Cambodia was once the home of the Khmer Kingdom houses the 7th wonder of the world. Siem Reap is one of the main cities that brings out the Khmer culture best. “Aroun suostei. Good morning and welcome to Siem Reap”, greeted my friendly local tuk-tuk driver, Tim. Aroun…What? What’s that? — I paused and thought to myself. Confused, I rambled through my brain looking for the meaning but nothing came up. Tim noted my confused look and immediately that the phrase meant good morning in the Khmer language. “Terima kasih! That means thank you in Malay”, I said to Tim. We both burst into laughter. It was the first time I have actually communicated with a Cambodian and paid attention to the Khmer language. How so familiar yet, so foreign. Putting some thought and Google into this, the Khmer language is the second most widely use Austroasiatic language. The tuk-tuk ride from Siem Reap-Angkor International Airport to town takes about 15 minutes to arrive. The roads from the airport were seemingly empty. The country-side seems to be slightly barren — reddish-brown desserts were affluent on both sides of the road. There were some trees here and there, but mostly sand and dust. My throat became dry in the dusty environment. By the time, we reached the roundabout, I realized how dangerous and crazy traffic can be in Siem Reap. Are there any traffic rules at all? Like, seriously? A motorcycle overtook us from the left while a car just zooms out right in front of us from nowhere. Woah! This place reminds me of Vietnam and Bangkok — at least in terms of traffic. I must say that I am glad that I abandoned my initial plans of riding a scooter here, with no prior experience in such crazy traffic. If I did, I am sure I would have been in a horrific accident within the first few hours of my trip. Thank God! It was too early for me to check into my hostel. Thus, Tim brought me to a few places in downtown. The first place we stopped at was Preah Ang Chek Preah Ang Chorm. It was a small and simple temple in the middle of the park, opposite the Royal Residence. I removed my shoes as a sign of respect visiting any Buddhist temples, leaving them with a sandal watchman. Surprisingly, there were no fees being charged for both the watchman and entrance. It was quite a pleasant surprise as I have read most temples in Cambodia do charge some USD to its foreign visitors. The small temple was fuming with smoke from incense of its worshippers. It was obviously a busy and a popular place for locals to visit. I was amused to see at least six pairs of lovebirds taking their wedding photos in a park that has bats sleeping on the trees. Tim: He will be this (local) lady’s delicious dinner tonight! As I walked into the small temple, Tim explained to me that in Khmer Buddhism, there are female Buddhas. It was folly to have assumed that he meant the Goddess of Mercy, Guan Yin. Preah Ang Chek and Preah Ang Chorm are the names of 2 different Buddhas. Noting this, I tried to re-think if I have ever learned about this — I felt unlearned about my own faith. Preah Eng Chorm is the shorter Buddha and Preah Ang Chek is the taller Buddha statue. They are the two Buddha sisters dressed in traditional robes of Theravada Buddhism. These statues are believed to be around for about a thousand years. With such old age, these statues have some legendary stories behind them. Locals believe that the Khmer Rouge once came to Siem Reap and tried to destroy the country’s religion by removing these two statues. As the rouges tried to steal these statues, the statues became heavier by the second. Unable to remove the statues, the Khmer Rouge eventually gave up. Another legend states that the two statues are actual Cambodian Princesses. These two beautiful, kind and humble princesses sacrificed their lives to protect locals during turbulent times of the Khmer Kingdom. They are said to be sleeping in the middle of Tonle Sap Lake quietly and will continue to protect the people of Siem Reap. Therefore, locals believe that it is best to worship the Buddha statues with water and a pure mind. Additionally, locals believed that the statues bring good luck to newlyweds — that explains the wedding photoshoots I witnessed outside of the shrine. Wedding photoshoot at the park. Listening to the stories of these statues, I understood why a small shrine like this was able to harness about 300 visitors per day. Its carefully ornated exterior is just as intriguing as the stories that come with the statues which the shrine houses. However, the truth appears to be a tad far from locals’ belief. “You must visit Angkor National Museum if you want to know the truth about Angkor Wat. I am not educated on the whole history of Angkor Wat. It is cheaper to visit the museum than to hire a guide as you are visiting Siem Reap alone,” said Tim as he ushered me onto his tuk-tuk. Fair enough. Tim made a valid point as he knew that I was on a budget backpacking trip. Most sites state that guides in Angkor Wat would cost me an additional 30 USD or so per day. On the other hand, the entrance to the museum was 12 USD — which I found to be a little too steep for my budget. Once we reached the museum, I found out that if I was interested in renting an audio guide, that will cost an additional 5 USD. Frankly speaking, I was quite put off with the high price and optional additional fees. I stood at the ticket counter to ponder if this museum will be worth the visit. The mall-like exterior was not very convincing, but then again, who am I to judge a museum by its exterior? I love history and — heck! I am already standing at the counter and I did not want to be clueless about Angkor Wat when I visit it the next day, neither did I wanted to pay another 30 USD for an actual guide. So, I paid for the ticket and went on to spent about two hours in the museum, absorbing as much information as I could. The interior of the museum swoons me over. It almost felt like I was brought back in time. My interest in Angkor Wat grew tremendously. The museum was well-designed interiorly with fascinating statues accumulated for years placed in eight different sections. The Gallery of A Thousand Buddhas were the utmost fascinating part of the museum. Some other highlights for me were the special coverage of Angkor Wat and Angkor Thom — exactly what I came here for. Every artefact is labelled with explanations and stories on how they were found. It is true that there are many labels that seem to be repeated, but each statue is made of different time, material, and brings a different feeling. One of the artefacts outside of the exhibition halls. Bear in mind, Hinduism is not an easy religion to dig my head into. The name of Gods, Goddesses, and its myths are beyond just what one small label can do. The constant explanations in the museum did a good job in feeding me the knowledge I needed to understand Hinduism and Angkor Wat, a lot more than my history textbooks did. In my humble opinion, my 12 USD was well-spent in the end. I did feel a little annoyed that the Cambodian government did not include explanation labels in Angkor Wat itself. I can only hope that this extra fees will provide as a livelihood to the locals working in the museum and local tour guides. A small tip that I later found out is that there is a coupon inside the Siem Reap Travel Kit map. 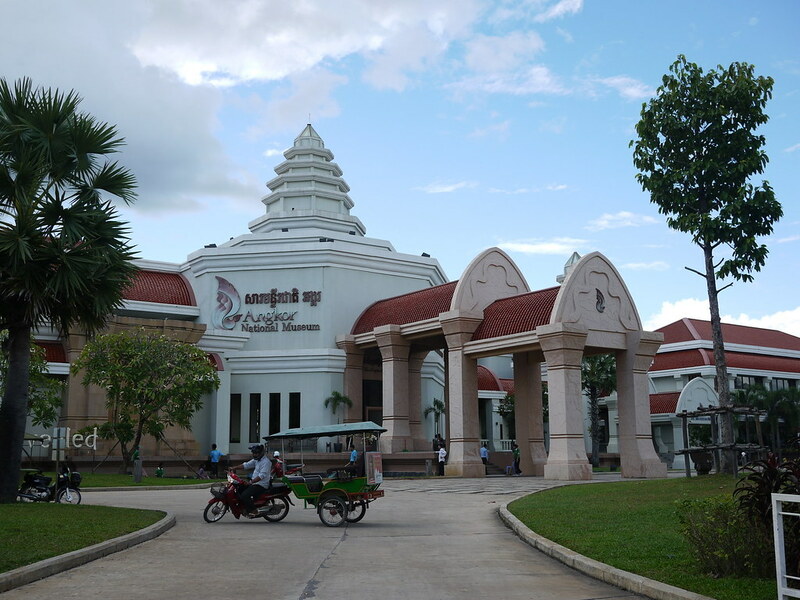 The coupon offers a $10 admission fee for foreigners visiting Angkor National Museum. Some hotels are able to provide you with the same deal. Kids pay 50% of the price. Click here to read Part 2 of the story and more of Siem Reap city: Killing Field Temple, Angkor Night Market and Pub Street. Click here to skip to Part 3 of the story to read more on one day trip out of Siem Reap city: Phnom Kulen National Park, Banteay Srei and Bang Melea.